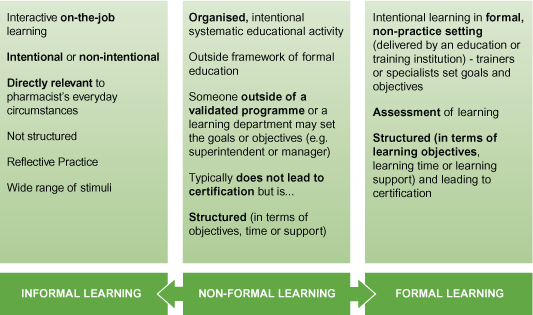 There are many opportunities for CPD ranging from informal learning “on-the-job” to formally accredited educational programmes. You are encouraged to use a variety of learning sources. The important thing is that whatever the activity, the result is not just an increase in knowledge or retained data but also the acquiring, maintaining and updating of the skills and competencies relevant to an individual’s area of practice which are necessary for maintaining good standards of practice and patient safety. Informal learning means learning from unplanned or unstructured events e.g. learning from incidents, near misses and adverse events that have occured. Formal learning includes educational activities which have been accredited by an institution or accrediting body e.g. the Intitute's accredited CPD programmes as well as CPD programmes accredited by other bodies. Non-formal learning includes educational activities which have not undergone a formal accreditation process.